This topic contains 5 replies, has 3 voices, and was last updated by admin 1 year, 1 month ago. I have used the “Unicode” setting on the “Language support:” dropdown on the options of the Field Map Layout. Once I used the Unicode option, it caused the auto size of the font in PDF. How could I use the default font type in Unicode settings in the “Language support:” dropdown..? That’s not the expected functionality or result. 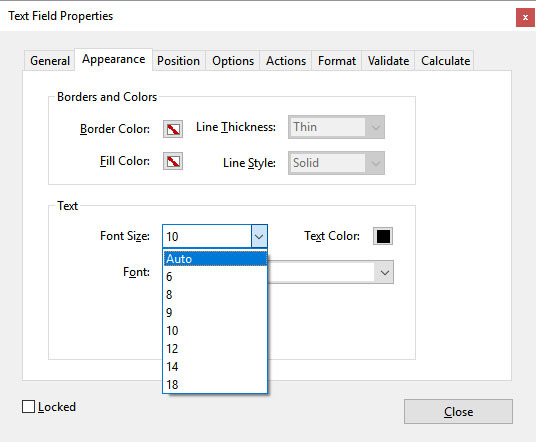 Double check the PDF form field settings to be sure they are set to a font size and not set to ‘auto’. You can also try not using the Unicode option, instead changing the PDF font to Ariel or any other font that will render superscript. Upload the PDF here if you’d like us to take a look at the font/superscript issue. I have used “Adobe Acrobat Pro DC” to create the PDF. Adobe provides detailed documentation on their site, here’s the form field properties page. Setting the font size to Auto undermines the goal of our design. And we already have the font set to Auto. Would us choosing a different font, yet still leaving the Size as Auto potentially solve the problem? Yes, you can/should use a different font, find one that is compatible with superscript. Our suggestion was to use a preset font size not the ‘auto’ setting.